SLCs – self leveling cements - Cement-based, polymer-modified, self-leveling products that can be applied in thicknesses from 1/8 inch (3.2 mm) to 1” (2.54cm) and that can be feathered at edges to match adjacent floor elevations. Pours deeper than 1” can be done by adding an aggregate, 3/8” pea gravel. 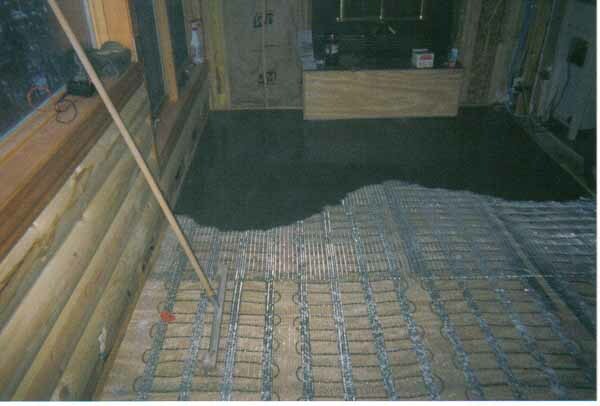 SLCs can usually be applied over old or new concrete, ceramic tiles, wood, radiant heat and terrazzo. They cannot be installed over gypsum products. Suitable as an underlayment for most flooring products, they cannot be used as a wear surface unless expressly stated otherwise by the manufacturer. When the cement is added to water and mixed with an electric drill and paddle it will have the consistency of a pancake batter. The mixture is poured onto the work surface and spread into place. A minimal amount of “troweling” is required, usually one pass with a smoother (a toothless trowel). Most of these products can be walked on within 2-4 hours of application and new flooring installed in 24 hours. Check with the manufacturer for detailed information. 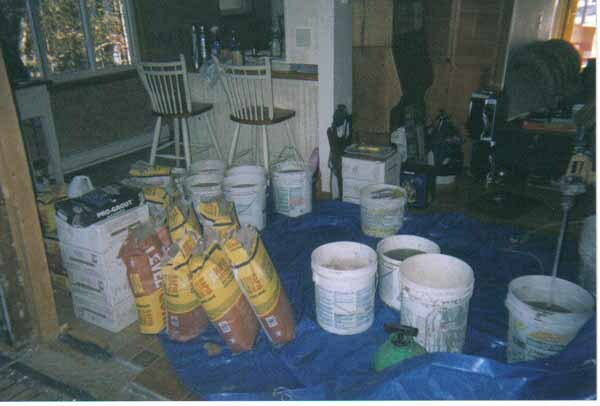 When priming a concrete floor one coat is usually enough unless you see the concrete quickly absorbs the application. Plywood and CBUs will require two coats wait for the first coat to get tacky before applying the second. The primer can be applied with a soft bristle push broom or paint brush in small areas some pros also use a short nap roller. Rinse well with water for clean up. Don’t leave any puddles, they take forever to dry. A fan can be used to accelerate drying. 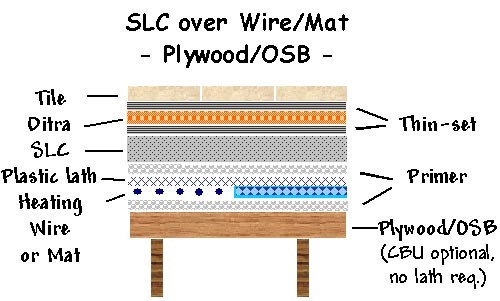 All pours over plywood require a mesh or lath. Prime the floor first then attach 2.5-diamond lath mesh. Fasten every 6” with staples. Or more as necessary. Last edited by flatfloor; 10-18-2007 at 11:51 AM. First and most importantly read and follow the directions for prepping the substrate prior to priming. This is the most important part of the job. All Mfrs. of SLCs require the same procedures. Oil, grease, sealers, adhesives, etc must be removed. Then BROOM the primer into the substrate with a soft bristle push broom. Eliminate puddles. If you do not follow these procedures the job WILL fail. Aroumd the full perimeter of the floor (and this applies to large or small jobs) attach some self sticking insulating foam. It comes in rolls, the 1/4" thick material will do. The width depends on how high your pour will be. You can trim off the excess with a sheetrock knife after the SLC hardens. 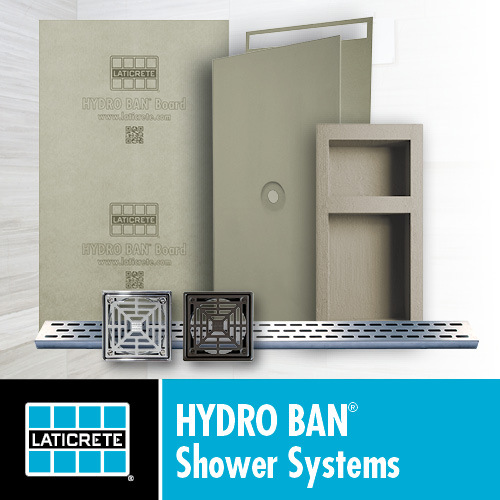 This permits expansion of the SLC and will prevent tenting of your tile. Fill the garbage pail with water; keep the hose charged in order to refill the garbage (reservoir) pail as you use water. Open about 70 bags of material with a utility knife. Start mixing, mix two bags at a time, mixing requires two of your men, when the first batch is mixed place it on the dolly and one man transports it to the pour area where he and the spreader pour it. While that batch is being transported and spread, another batch is being mixed in the 2nd mixing barrel. Repeat until complete. Allowing 3 minutes per 2 bag batch that’s not quite 2 hours. You must size up the job in advance. Make sure you have enough hose and extension cord. Defend against other trades using your water and power sources Keep a small pail handy with a few handfuls of dry SLC in it in case you see a leak. Throw a handful into the leak it will plug right up. If you are working in hot weather try to get some BLOCK ice for the reservoir (your favorite beer distributor) or lots of bagged ice if no block is available. I have seen a lot of concern about melding the old material with the new, perhaps the stuff your using sets up too quickly, you should have at LEAST 10 minutes before it does. I know, I know, I didn’t allow any time to assemble all the material in place or to install stops (dams) or for standing around. Last edited by flatfloor; 02-23-2007 at 03:47 PM. Mixer (egg beater type) part no.....12-851-B7.... This may be cheaper at a big box. Smoother and spreader come with 5' broom handle. Custom Levelquik ES Home depot will get this for you. You must tell them it is a SPECIAL ORDER MODEL # LQESL50. [Edit, CX, 02-22-17, from Custom through alert reader lojoma] "This particular product will be a special order for Home Depot. The special order SKU # is 307254. The item number you provided is correct (LQESL50). Your local Home Depot will need to call our customer support for pricing." 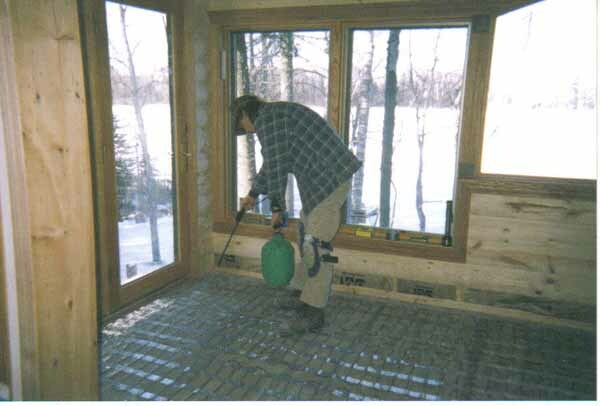 Pouring SLC over an electric heat system is an alternative to setting the mat or wire in thinset. Some people find it quicker and easier than troweling thinset over the heating system. It is also more expensive. 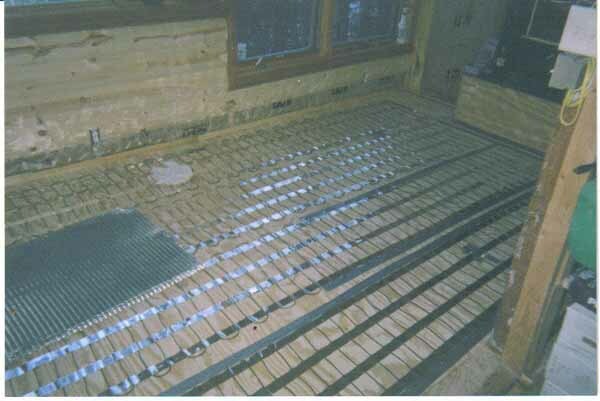 When installing electric radiant heat flooring you will find that every manufacturer has slightly differing recommendations to their installation guidelines. The following method is for use over plywood subfloors or cement slabs.For cement slabs there is no need for any metal or plastic lathe as is used for a plywood installation. 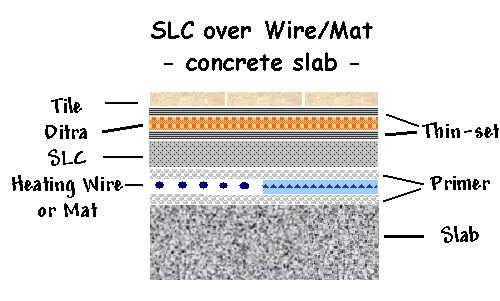 Following the manufacturers recommendations for installing the wires or mats is important, following their guidelines for installing tile directly over these mats generally leads to frustration and in many cases an installation that has an inferior finish due to trying to set over a surface that is not flat and sometimes one that has sensors that are thicker than the thinset bed you are trying to set tile into. As a professional installer we have found that installing the electric heat and following this with a Pour of Self Leveling Cement to a thickness of 3/8-1/2”(depending on heat system) provides an excellent flat surface for tile installation and additional mass to retain heat. Once poured it also protects the Heating System from damage while setting tile. A Word of Advice: Some manufacturers include an alarm (others have it as an option)to hook up during installation that are designed to indicate a problem should one occur. Using these is fine, and we recommend them as they will tell you immediately if a break has occurred and be assured it will be right where you are working. There is no substitute however for using a proper Ohms meter before pouring a Self Leveling product over the installation and at the points mentioned in the instructions that follow. Write down your readings as you take them, date and time of reading also. When finished, keep this note with your warranty papers. The following method is what we used professionally. 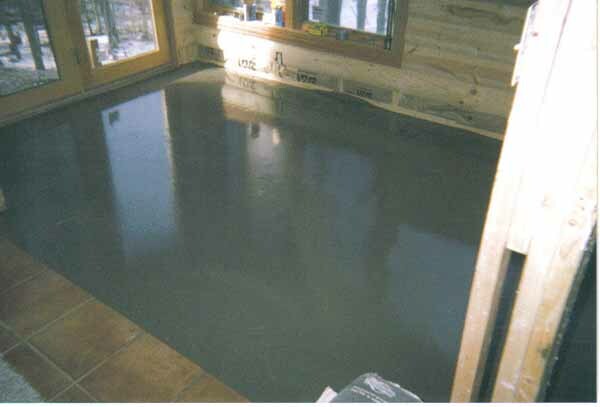 1 - Prime floor 1 coat with Self-leveling Cement primer. (seal or cover any cracks seams or holes with caulking) Some substrates such as CBU, plywood or very porous concrete will require two coats. 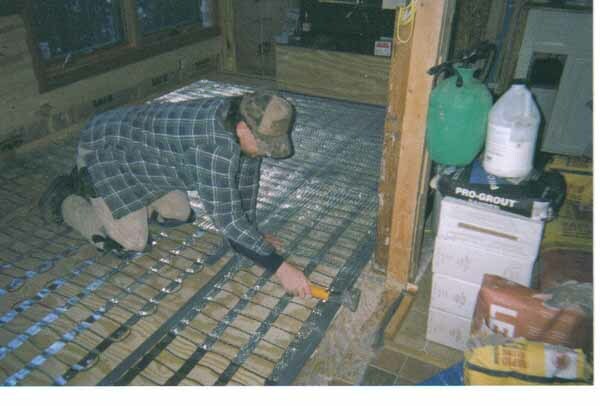 2 - Install radiant heat system as per manufacturers instructions. 5 - Install self-sticking foam strip insulation around perimeter of room. Frost King ¼”wide x ¾”high was our standard. 6 - Cut 1x2 into dam material for use at doorways or anywhere Tile will end and meet with another flooring type. Leading edge should have layer of duct tape run lengthwise and wrapped underneath. This helps to insure a clean break when Dam is removed. Stuff ducts with old towels , rags etc and Staple Heavy cardboard strips that are faced with duct tape inside floor heat ducts. Caulk around edges to seal and add duct tape inside for added protection. Seal any potential leak areas with either caulk or larger areas with expanding foam. 7 - Test wire leads with Ohms meter and note numbers. NOTE:Spraying of primer is not a duplication of step #1. It provides a primed surface on the new components, heating mat/wire and plastic lath, that have been added since the initial priming. 9 - Wait approximately 1 hour for primer to dry. While this is drying prepare your bags, buckets mixing equipment etcetera. 10 - Test all leads with ohms meter again making certain no damage has occurred. This is your last chance before wires are covered. 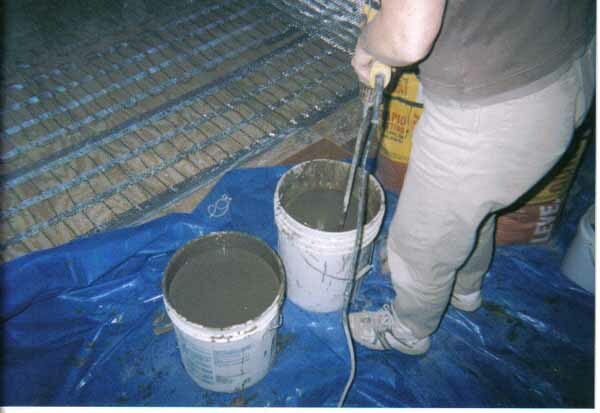 11 - Pour Self Leveling Cement following Directions already in library as provided by Flatfloor. 12 - Allow this to dry overnight. 13 - Remove all Dam material from Doors, ducts etcetera. Carefully scrape down level any high spots. DO NOT remove extra perimeter insulation material. Leaving it in place will insure proper expansion is achieved for next steps. 14 - Using a straightedge that is a minimum of 8’ long, check all areas for flat. If you do find any area’s that are not flat you will want to repair or fill before proceeding to the next step. 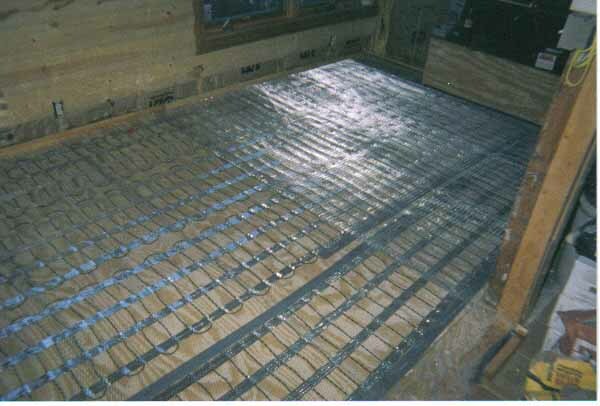 15 - Install a membrane from Schluter, Noble, Custom etcetera that is designed for use over a radiant floor heat system. Last edited by flatfloor; 04-17-2007 at 03:10 PM.